TGCET 2018 2nd phase #5thClass Admissions counselling, Certificates verification dates, School wise Provisional list, TGCET 2nd phase Admissions counselling 2017. Candidates are shortlisted in the ratio of 1:2 for the available vacancies in Class V for Admissions through Counselling. TGCET 5thclass entrance test 2017 2nd phase certificates verification dates, TS Gurukul CET 5th class 2nd pahse admissions counselling dates. List of documents for 2nd phase TG Gurukul CET Certificates verification, 2nd phase TGCET 2017 Results or School wise Provisional list(School wise alloted candidates lists) of Telangana Gurukul CET and more details are given here. This year. Government of Telangana, TSWREIS issued the TGCET 5th Class Entrance Test 2017 notification on March 16 for 5th Class admission in TREIS, SC, ST and BC Welfare Residential Schools for the academic year 2017-2018 and tgcet online application forms were invited from the eligible students for admission in Telangana Gurukulams through TS Gurukul CET 2017 5th class admission test which was held on 09-04-2017. 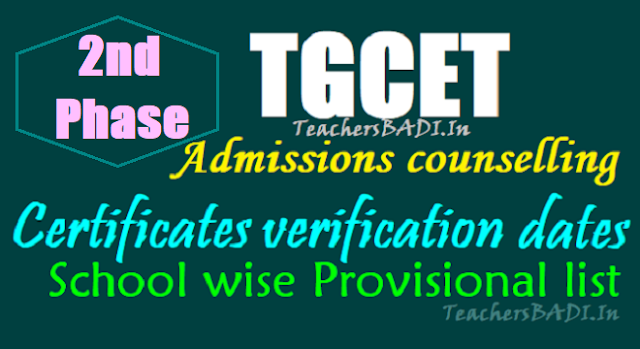 Now, TSWREIS has announced the TGCET 5th class 2nd phase Admissions counselling dates and School wise Provisional list(School wise alloted candidates lists) on July 5th. The following guidelines are issued for 2nd phase counseling for filling up of the vacant seats in Class-V after completion of 1st list of admissions. Candidates are shortlisted based on Rank (merit) achieved in the TGCET held on 09.04.2017 category-wise in the ratio of 1 : 2 to avoid further lists and unfilled vacancies. d) All the District Conveners are instructed to undertake sliding of students from one school to the other as per their option subject to availability of vacancies as per their merit and ranking. e) They are instructed to carry on the counselling and allotment of schools telephonically. In respect of the candidates shortlisted under open category, they may also be considered under their reservation category for allotment of a School of their choice. f) After exhausting the candidates shortlisted under open category only, the candidates shortlisted under reservation category shall be resorted to. g) The district convener may constitute a counselling committee under his/ her chairpersonship with the ATP, a senior teacher and a senior member of ministerial staff available with the convener school. h) Cent per cent transparency shall be maintained in calling for the candidates as per their merit and ranking. In no case a better ranking candidate is to be ignored over a lower ranking candidate. i) District Conveners may utilise the services of any of his staff members for smooth conduct of the admission counselling and he will be held responsible if anything goes wrong in allotment of seats and schools. j) All the Principals in whose schools vacancies are available should attend the venue school along with the vacancy position and bidder list. All the concerned Principals have to conduct admission counselling cohesively. 9) Passport size photographs 4 nos.